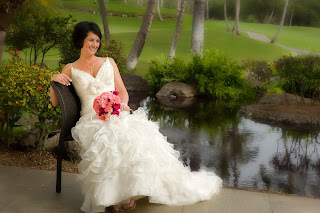 Penny and Alan chose Gannon's in Wailea for their wedding ceremony. The lawn offers a sweeping view of the Pacific Ocean and the island of Kahoolawe. Marry Me Maui Wedding Planners along with Maui Wedding Photographer Joe D'Alessandro provided their services to help make this a spectacular Maui Wedding. With the beach just across the road, we were able to take the couple down for a sunset beach session after the ceremony and family pictures. We offer reasonably priced Maui Wedding Packages for couples, vow renewals or civil unions. We can mix and match our services to meet you needs. A Maui Wedding can be more affordable than staying home as you can mix the ceremony with the honeymoon.